Back to school shouldn’t mean back inside for kids. While busy school schedules, sports and other extra-curricular activities make free time for playing outdoors or a trek to the park more challenging, National Wildlife Federation and the Natural Learning Initiative at North Carolina State University, have developed a guide to creating enticing outdoor play spaces as close as your backyard, patio or balcony. The hazards associated with the new “indoor childhood” are well documented. The most serious by far is the risk of increased childhood obesity. Playing in nature and helping in the garden are ways to foster a more balanced and healthy lifestyle. According to the guide, being outdoors in nature offers multiple benefits: children may be better learners, play more cooperatively, experience less stress, be healthier and happier when they have regular opportunities for free and unstructured play in the outdoors. Even ADHD symptoms may be reduced. “Children have a natural affinity toward nature. Dirt, water, plants and small animals attract and hold children’s attention for hours, days, even a lifetime,” said Robin Moore, Director of the Natural Learning Initiative. Gathering natural materials like sticks, leaves, and grasses to use in imaginative play. The simplest nature play consists only of gathering some of nature’s “loose parts” already present in a yard. Collecting branches, logs, sticks, and rope to build a fort, hideout or den. Using a hollow log, planter or corner of the yard to make a miniature scale fairy village. These become enchanted places that stimulate creative, dramatic play in make-believe settings. Planting or potting fragrant, colorful, and textured plants like rosemary, lavender and thyme to make a sensory garden. Creating a vegetable garden of their own so children grow up understanding that all food comes from the Earth. Providing food, water, nesting places and shelter for wildlife to make your yard a Certified Wildlife Habitat and a place children can observe and appreciate birds, butterflies and other creatures. Setting up small stumps of various heights that children can step across for learning balancing skills. 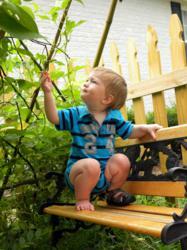 Helping with garden tasks like planting, watering and harvesting provide hands-on play and learning opportunities. Creating Adventure Pathways to encourage exploration. For a child, these pathways can lead to a secret place all their own where they can escape any stresses they may be feeling. Observing the wide array of wildlife that frequent a water garden like dragonflies, lizards, frogs, toads and salamanders. Children are fascinated by these aquatic habitats and the creatures which live there. Limited space shouldn’t deter home owners from embarking on Nature Play Space projects. The Nature Play at Home Guide includes a whole section on “small space solutions” so even patios, small yards, and balconies can provide opportunities for kids to connect with nature. The Nature Play at Home Guide supports National Wildlife Federation’s Be Out There movement to reconnect families with the outdoors. NWF’s practical ideas and activities help make being outside a fun, healthy and automatic part of everyday life for American families. Check out http://www.beoutthere.org for information to get children and their families back outside – where they belong! “So… open the door, allow your children to breathe the fresh air, listen to the bird song, and be with nature,” concluded Moore.